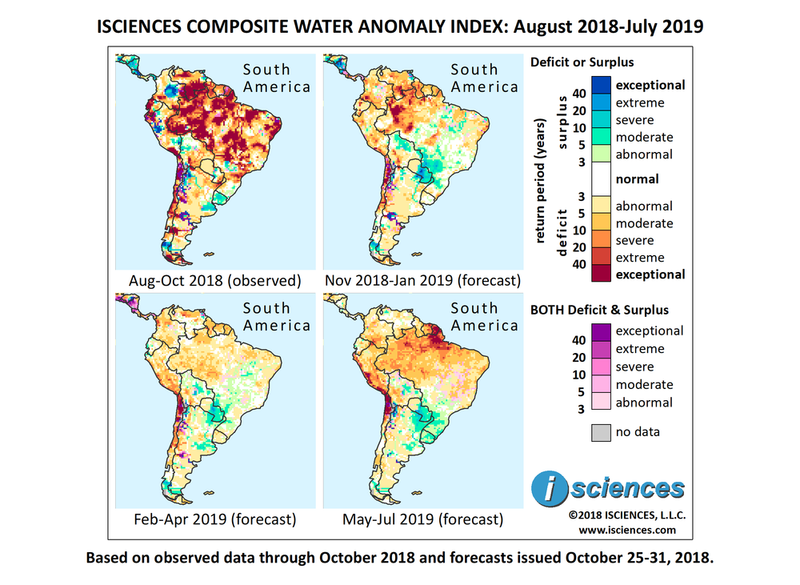 The 12-month forecast through July 2019 indicates deficits across the northern bulk of the continent with large pockets of exceptional intensity in Amapá, Pará, Amazonas, and Mato Grosso, Brazil. Deficits of generally lesser intensity are forecast for Brazil’s northern neighbors. Intense deficits are expected in southern coastal Peru leading through northern Chile to Santiago, and along a path in south-central Bolivia beginning near Cochabamba. Areas of surplus include: central and eastern Paraguay and nearby regions of Argentina and Mato Grosso do Sul, Brazil; northeastern Bolivia; northeastern Rio Grande do Sul in southern Brazil; Uruguay; Buenos Aires and Neuquén Provinces in Argentina; and Patagonia surrounding O’Higgins/San Martín Lake and along Río Santa Cruz. The extent of exceptional deficits in the region will diminish considerably over the next several months. Through January, deficits of varying intensity are forecast for northwestern Brazil and its neighbors to the north and west. Deficits are expected to be extreme to exceptional in Amazonas and Rondônia, Brazil; southern Venezuela; southwestern Colombia; and a pocket surrounding Quito, Ecuador. Deficits will downgrade somewhat but remain intense in a path from southern Peru through the Atacama Desert and past Santiago, Chile, with some areas exhibiting conditions of both deficit and surplus. A path of moderate to severe deficits is forecast in Bolivia from Cochabamba past the southern border. Deficits of similar intensity are expected in central Mato Grosso, Brazil. Intense surpluses are forecast in central and eastern Paraguay, and surpluses of slightly lesser intensity will reach across the borders into Argentina and Mato Grosso do Sul, Brazil. Surpluses are also expected in northern Rio Grande do Sul, Brazil, and pockets of Tocantins and Piauí; northern Bolivia; along the Culaba River in northeastern Argentina; Neuquén Province, Argentina; and Patagonia surrounding O’Higgins/San Martín Lake and along Río Santa Cruz. From February through April, deficits will moderate across much of the northern part of the continent. Severe to exceptional deficits remain in the forecast for Chile’s northern half, and moderate to severe deficits in coastal and southern Peru. Surpluses will downgrade slightly in Paraguay, shrink in Bolivia and Brazil, persist in aforementioned areas of Patagonia, and emerge in Buenos Aires Province, Argentina. In the final quarter – May through July – deficits will increase and intensify in Brazil, Suriname, French Guiana, Colombia, Peru, and northern Chile. Surpluses are forecast for eastern Paraguay, northeastern Argentina, southern Brazil, Uruguay, and Buenos Aires Province. Widespread flooding hit Trinidad last month, leading the Prime Minister of Trinidad and Tobago to declare a national disaster. The country reportedly received a month’s worth of rainfall within three days, causing the Caroni River to overflow its banks. The Prime Minister is seeking Cabinet approval for TT$25 million (US$3.7 million) in flood relief. Amid the aftermath, two earthquakes struck off the country’s coast. Drought in Brazil, the world’s largest sugar exporter, helped drive sugar prices up 2.6 percent between August and September of this year, according to the Food and Agriculture Organization. As Brazil’s president-elect, Jair Bolsonaro, prepares to take office in January rainforest biologists worry about his ambitious plans to develop more Brazilian wildlands into areas of cultivation, mining, and roadways. If his campaign statements become policy, deforestation rates could triple, they say, and the Amazon Rainforest, which historically regulates a large component of its own hydrological cycle and that of the South American continent, could transition rapidly to woodland savannah. Instead of functioning as a carbon sink, a deforested Amazon might instead release greenhouse gases, exacerbating environmental issues nationally and the globe at large. Already, the Amazon’s dry season is lengthening and rainfall has dropped by 25 percent in some regions. At the same time, increased frequency of intense precipitation events has caused massive flooding in recent years, including in 2009, 2012, and 2014.